Trading is an option for any person that wants to elevate themselves above their circumstances and achieve financial freedom. Investing and day trading can be the path to a new level of existence, where you do not have to rely on other entities for income, security or basic necessities. Etrade has the market cornered on commercials and casual investors. The company has been operating since the 1990s and is well-known by online investors and casual watchers of financial news. The company is great at making cool commercials and getting its name out there. The marketing department should be commended. The question always is, can it work as a platform for more active traders. For new investors, it is only $500 to open an account and trades cost $6.95. That is pretty low as far as retail brokers go. Investors that make 30 or more trades per month can upgrade to Etrade Pro, where the account minimums go up and the fee-per-trade tend to go down. That can be a tricky place navigate for new traders. Novice day traders, no matter what platform they use, need to be able to understand the risk that they are taking on. There is not a lot of leeway for traders that first start in the industry. The key is to find a good day trading education site and learning all about the strategies and techniques before taking on the regular markets. Etrade can be a good place to start, if you have a few thousand dollars to play around with. Always trade or invest with money that you can afford to lose. There is not a lot of success stories of people mortgage their house or using their life savings to start day trading. It can be a bad way to go. When you start with Etrade, you can use the platform to make small trades and research the companies and the markets that you want to participate in. Do you want to work with stocks or mutual funds? DO you want to trade futures or commodities? How about ETFs? The educational aspects of Etrade are decent but you need more than that if you want to get good at day trading. That is where you need to find veteran day traders at these education sites that will share their desktops in chat rooms. That kind of environment, where you get to see people try our strategies and approach the market each and every day is -pretty amazing. It will give you a wealth of knowledge and experience. For Etrade, the tiered commision structure is a way for active traders to really take advantage of the platform. Especially for intermediate day traders. They can use a well-honed platform to play around in the market and spend less on trades as they make more of them. 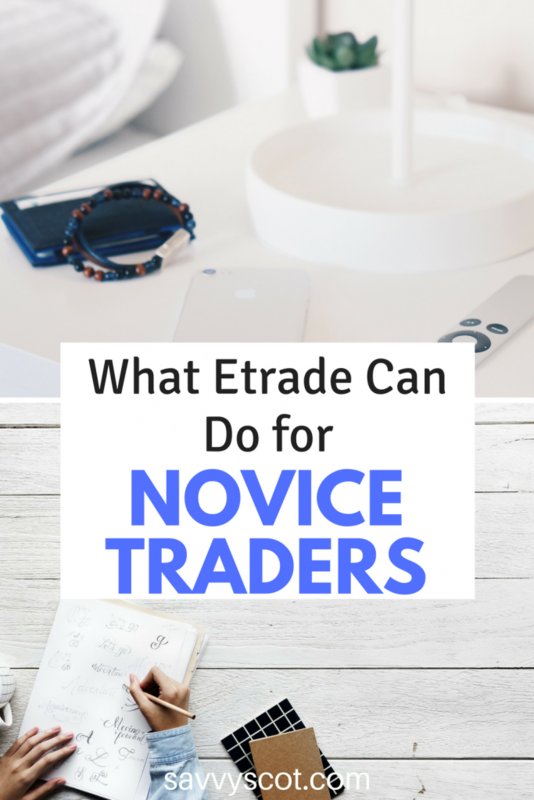 The bottom line is that beginner investors can get a lot from the broker, from a place to start slow, to learn and research to a place where you can really find your way as a novice day trader.